The Canadian Association of Optometrists recommends an initial comprehensive eye exam at the age of six months ... that's right, six months. 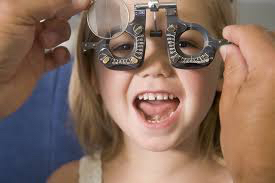 At that time, your optometrist will objectively assess your child (no input required) for a high or unequal prescription, eye misalignment, or eye health abnormality that can interfere with normal visual development, a process that isn't complete until six or eight years of age. In fact, amblyopia, or "lazy eye", is the most common cause of preventable vision loss in young adults. It's likely that your child's pupils will be dilated with a kid-friendly, non-preserved drop, giving your optometrist the best opportunity to detect abnormalities. The importance of the infant eye exam is emphasized by its inclusion on the Region of Waterloo Well Baby Checklist. Curious about what happens during an eye exam for an infant? Click here to see for yourself. Assuming that your child's infant exam goes well, follow-up will usually be scheduled at around three years of age. By thisage, most kids are able to participate in the games that make this exam fun. Assessing prescription, eye coordination, depth perception, colour vision, and eye health all help ensure that your little one has the visual ability to be ready for school. As many as one in ten preschoolers can have an eye or vision problem significant enough to impact learning; however, signs or symptoms may be subtle, or more often than not, absent altogether. Click here to watch Dr. Karen MacDonald assess a three year old. Around the age of five, your child can give even more subjective input, allowing your optometrist to fine-tune some of the earlier testing. Distance visual acuity, reading ability, and eye coordination are particularly important as school begins in earnest, and eye health assessment is essential for patients of all ages. If you'd like to preview an exam of a 5-year old, please click here. It's critical that parents recognize the difference between a vision screening and a comprehensive eye exam. Screenings, often performed by lay volunteers with the best of intentions, often miss kids with vision problems, giving parents a false sense of security, and delaying diagnosis and treatment. In Ontario, OHIP insures eye examinations until the age of 20, and the Eye See ... Eye Learn program covers the cost of eyeglasses for eligible children. There's no reason that your child should't see the optometrist early and often. Click here to watch Dr. Karen MacDonald chat with Global News about the importance of routine eye care for children. Visual perception is the ability to make sense of what we see, and is particularly important in learning critical skills including reading, writing, drawing, and solving puzzles. Kids who are struggling in school may have excellent vision, but poor visual perception. Following a comprehensive exam to identify any refractive (prescription), eye coordination, or eye health concerns, your optometrist may recommend an assessment of sensory processing, visual memory, visual spatial relationships, and other visual perception skills. If necessary, remediation training may help your child learn more effectively. However, don't put the cart before the horse: VP testing should always follow, and never be considered without a full eye exam.